Dennis Peron’s legacy is seen anywhere marijuana is legal. As one of the primary forces behind California’s revolutionary medical-marijuana law, Proposition 215, Peron planted a seed that sprouts every time another state adopts medical marijuana or legalizes cannabis use for all adults. Cannabis Now recently spoke with the ailing legalization icon at his San Francisco, California home. A little after noon, the cold snap gripping the Bay Area breaks just long enough for a perfect San Francisco day: cool, crisp, clear and just warm enough in the winter sunshine. Dennis Peron sits on the edge of his bed in the basement of his home, the “Castro Castle,” a rambling fortress of a hippie crash pad in the long-gentrified Castro, instantly recognizable by the frontispiece painted with an image of a young, feminine Buddha. Tacked to Peron’s bedroom wall, near the hippie tapestries and a television monitor, is the cover of an issue of High Times from the late 1990s; Peron is on the cover. Peron, 70, has late-stage lung cancer. In a few minutes, his brother will drive him to another chemotherapy session. Right now, Peron is smoking a cigarette and receiving a visitor, here to say hello — and possibly goodbye. The chemotherapy means Peron, an imp of a man at five-foot-five who has enjoyed impish good looks nearly all of his life, even after a 2010 stroke nearly froze his face, is finally going bald. But his eyes are still a clear blue and his voice is stronger than it was at his last public appearance. And he’s still on message. “The first time you’re using it, you’re not really using it,” he says, explaining his philosophy that all cannabis use is medical. Now that Dennis Peron is dying, friends, acquaintances and perfect strangers have been calling and offering him things. A week ago, an old friend — the head of oncology at San Francisco General Hospital — came to visit. This doctor is a shot-caller at the University of California-San Francisco, the best hospital in town, and has done groundbreaking research in medical marijuana — which without Peron would almost certainly not be a thing. Peron thanked him and asked for nothing. Later that day he headed out for another round of chemotherapy at the tired, old Veteran’s Administration hospital, way out on San Francisco’s far western edge. He managed, with the help of a walker, to march into City Hall and accept his commendation from the Board of Supervisors. Between raspy gasps, he expelled a few words through his stroke-clenched jaw. In many ways, Peron’s life is a San Francisco story. Many of the people enjoying legal marijuana in Maine, Massachusetts, Oregon, Colorado and Washington have not heard of him. But when California voters approved Proposition 215 — the first medical-marijuana law in the United States — it signaled the first piece to fall in a domino effect that has since spread across the nation. And while some might know Peron was one of Prop. 215’s authors, fewer people know the great personal cost he paid for a spot on marijuana Olympus. Once the biggest dope dealer in the Castro District, he’s been busted more than four times. During one raid, he was shot once in the leg by a San Francisco cop, who later declared he wished he’d killed Peron, as there’d be “one less fag” in town; just a few years later, an ex-cop murdered his friend Harvey Milk, the country’s first out gay elected official, who for a brief time held political meetings in a cafe Peron owned while dope deals went on upstairs. Peron lost friends and his lover to death during the HIV/AIDS crisis, which was when the country discovered — half by accident — that marijuana could be medicine. At the time, AIDS was a mystery. The disease baffled researchers and confused doctors and nurses, some of whom refused to treat patients, for whom a diagnosis was a death sentence. About the only thing that helped AIDS patients wasting away to eat, sleep, and live in less pain was marijuana. Through most of the 1980s, a former diner waitress named Mary Rathbun (aka “Brownie Mary“) handed out brownies — baked with Peron’s pot — to the patients in San Francisco General’s AIDS ward. After his lover died, living long enough to offer the testimony that acquitted Peron at his latest pot bust, Peron opened up a four-story medical marijuana dispensary on Market Street, San Francisco’s main drag — the country’s very first. Local officials refused to prosecute him, so the state attorney general raided him. Peron was lauded, while the attorney general was lampooned in the comic strip Doonesbury, but that was the end of his major dealing days. After Prop. 215 passed, marijuana clubs sprang up around San Francisco and Oakland like dandelions, but Peron was out of business. While recovering from his 2010 stroke, he was raided yet again by San Francisco narcs, one of whom was the partner of the cop who’d shot him 32 years before: the stress caused a seizure. Talking has been a challenge for Peron ever since. His speech comes slowly and then in spurts, propelled with great force through near-clenched teeth. But he still does speak, especially on cannabis. One of the great ironies of his life is that Dennis Peron, champion of marijuana, opposed all the recent efforts to legalize it. As the marijuana movement became the cannabis industry, Peron became a sort of go-to reactionary. If you wanted a cannabis person to say something mean or negative about the billionaire-bankrolled legalization efforts afoot, you could go to Dennis. “All marijuana use is medical,” he would say, which meant legalization was unnecessary. He insisted that Prop. 215 — the ambiguities of which set off almost 20 years of legal and legislative squabbling — was all California needed. Last fall, he took this message out on the road. 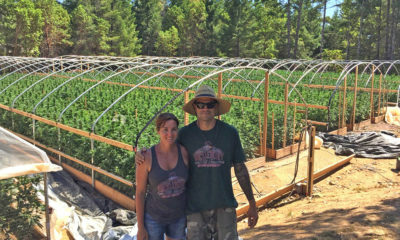 He went to Humboldt County, where growers were already preparing commercial-sized greenhouses for the commercial cannabis market, and told them that money was tyranny and that taxing marijuana meant giving up control. Calling cannabis “recreational” was the worst of all; it trivialized the plant. It didn’t work. Legalization passed overwhelmingly. Peron went back to San Francisco, where soon after, he found out he was sick. Very few of the billions of dollars now flowing through the industry he helped make possible have made their way back to Dennis Peron. Other weed icons have product lines and brands and investments. His old friend Jack Herer, dead for almost a decade now, has a popular strain named after him. But unless there’s a fortune hidden on an uncharted island somewhere, all Peron has is the Castle, his legend and his values. Attorney William Panzer, a co-author of Prop. 215 who worked with Peron on the campaign, said it was ultimately “saved” by big money from the George Soros-bankrolled Drug Policy Alliance, which also took control of the effort away from pot-dealing hippies like Peron. This could explain his negative reaction whenever big money showed up later. From the very beginning, Peron earned a reputation for handing out marijuana to anyone who needed if if they couldn’t pay (and sometimes, even if they could). This continued throughout his life. “Dennis is a man of the people,” said Ellen Komp, the deputy director of California NORML, with which Peron frequently butted heads over the years. To this day, she said, he still insists on talking politics every time they meet. Peron is notorious for a mischievous sense of humor, which he deployed to great effect during a quixotic run for governor — really a chance to tweak his opponent (the attorney general who raided him) on a grand stage. It hasn’t left him. It’s time for Peron to go for chemo. As I leave, Justmann informs Peron that another friend is coming to visit the following day. TELL US, what are your memories of Dennis Peron? R.I.P. DENNIS YOU WELL BE MISSED BY MANY AND BY ME AND SAN FRANCISCO WE LOVE YOU .WE WILL KEEP IT LIT FOR YOU…….SAFE JOURNEY…….. I just wanted to say I remember you well from the 70’s. I was an invited guest at your place in the city. Always enjoyed sitting and talking with you upstairs.. I actually was at your place shortly before the bust when a cop shot you.. I lived down on the peninsula and it was on the news when I got home. I was very worried for you.. .Now I use cannabis for a few medical issues. You are the Godfather of cannabis. I worked for you at the Island Cafe. I quit smoking pot years ago but I cherish the memories I had at 16th and Sanchez. At 17 I was a dishwasher there. I met Harvey. I expienced the Big Top. I visited Space Productions. These were real people and places. If you were there you know what Im saying. And a shout out to Kelly, Big Mac and Chester. The music was Great. Heartfelt Prayers, dear Dennis, in this transition and tender hugs all around to your caregivers there. I so cherish all the friendship, hospitality and dedicated community service you have given me and oh so many over these years. May the angels of mercy and light carry you higher. I never said I, or Cal NORML, butted heads with Dennis. I said he is a true man of the people. And yeah, he’s forever talking politics. This is a nice phrase: if they couldn’t pay (and sometimes, even if they could).